Oliebollen (lit. "oil balls") are sweet Dutch fritters that are traditionally served around the New Year period. Their current ball shape did not emerge until decent quality vegetable oil became commonly available (and affordable) during the 17th century, and food could easily be deep-fried. Recipes begin to appear in cookbooks in the mid-1600s. Before that time, basically the same dough was just pan-fried in some oil or lard. So, these fritters were round but flat. The first documented reference to these flat oliekoeken (lit. "oil cakes"), goes back to the 1300s (fried in linseed oil). The 17th century is also the period when Portuguese Jews migrated to The Low Lands, fleeing from Catholic terrorism known as the "Spanish Inquisition". 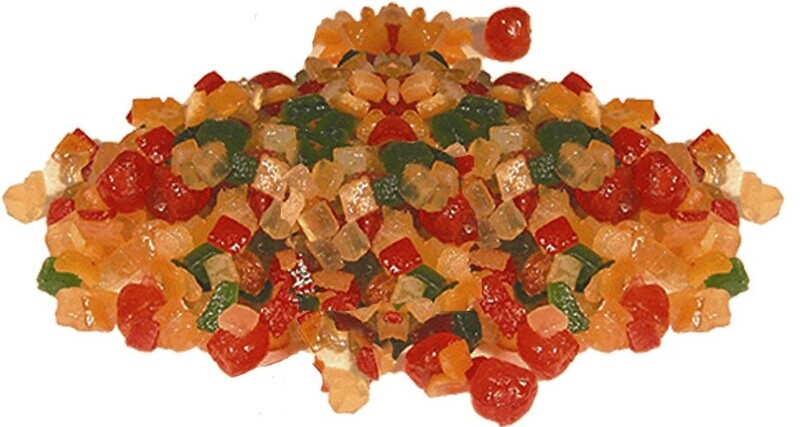 They may have contributed to including dried and candied fruit in the fritters. The name oliebol was not used in cookbooks until the late 1800s. 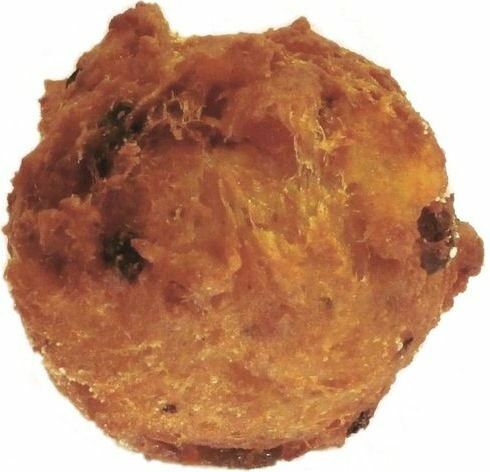 Oliebollen from bakeries and market stands typically have the size of a tennis ball (6-7 cm, just under 3 inch). Oliebollen recipe from pp. 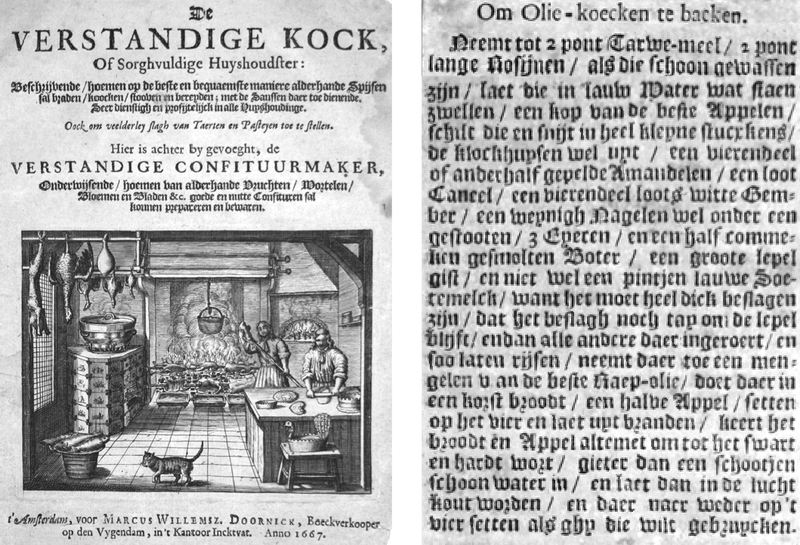 20-21 of the the 30-page 1667 Dutch cookbook "De Verstandige Kock, of Sorghvuldige Huyshoudtser"
Frying dough or batter that is made of flour, yeast, honey, and milk or water actually goes back several thousand years, e.g., to the old Egyptians (I guess there were no "young" Egyptians...). Their fritters were sometimes flavored with lemon, orange water, or rosewater. The plundering crusaders also returned to Western Europe with frying techniques (including for food) and recipes. Also during the Middle Ages, the Persians introduced sweet fritters to the Indian sub-continent, where a delicious milk-solids based dessert is known as Gulab Jamun, where "gulab" is a contraction of the Persian words for flower (gol) and water (āb), referring to the rosewater-scented syrup. In the Low Lands, the origins of flat fritters go back about 2000 years, to the Batavian and Frisian tribes. They (i.e., the fritters) were offered to the gods during Yule period around the end of the year. In the Middle Ages, the fritters were used to celebrate the end of the pre-Christmas fasting period, and as a source of calories for the cold winters. Towards the late Middle Ages, it became a tradition to give these fritters to poor people who offered their "Happy New Year" wishes. 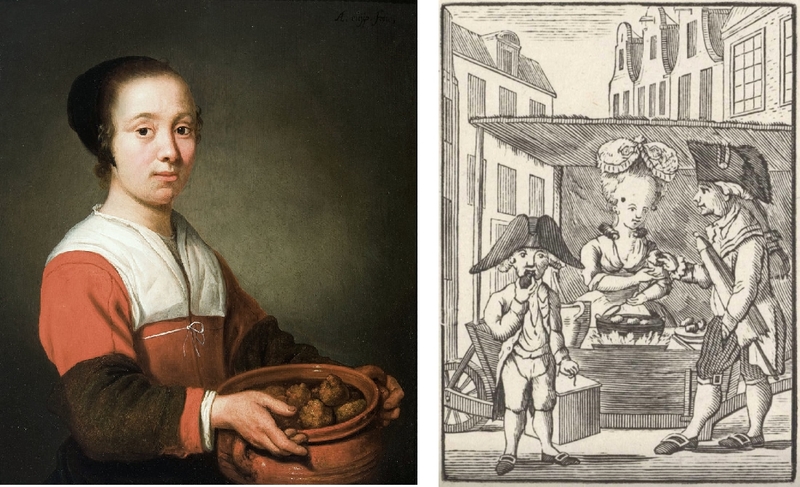 The recipe was also exported to the Dutch colonial possessions in South Africa ("Vetkoek" = "grease cake") and North America ("Dutch doughnuts"). The basic oliekoek and oliebollen recipe calls for flour, yeast, currants, eggs, pieces of apple and dried or candied fruits. The balls are made by scooping up batter with two large spoons, and letting the batter glide into the hot oil. With this technique, the "balls" are never perfectly round. Using a large ice cream scoop (6-7 cm) may result in rounder balls. A variation on the oliebol is de sneeuwbal (lit. "snowball). This is basically an oliebol (with or without the fruit) that is injected with very stiff whipped cream (sweetened), and covered with a thick layer of powdered sugar. Don't inhale when you bite into one of these! The recipe below is my personal adaptation of a basic recipe. In The Netherlands you can buy oliebollen batter mix, but the recipe below is made from scratch. 2 liters of un-used vegetable oil for deep-frying. I use sunflower oil. Do not use olive oil! Hand-mixer with dough-hooks (most hand-mixers are not strong enough to mix this dough with regular beaters). Some flour for dusting the raisins and currants. Slotted spoon or wire skimmer (D: Schaumlöffel, Fritierkelle; F: pelle écumoir, cuillière perforée, araignée à friture). 2 large spoons, or a steel ice-cream scoop with a large bowl (standard: 63 or 66 mm, 2½ inch). Soak the raisins and currants in a large cup or small bowl, pour boilinghot water over it, and let soak for 10 minutes. Peel and core the apple, and dice into pieces (about the size of a small raisin), and sprinkle with lemon juice (for flavor and so they don't turn brown). Put the flour and cornstarch in the large bowl and whisk (to loosen up the flour and get clumps out, if any; this is a lot quicker and easier (incl. cleaning) than using a flour sifter). Add the salt and yeast to the flour and thoroughly mix. Heat the milk until lukewarm, then take off the heat. Beat the egg, then add the egg and the vanilla to the warm milk, and blend. Drain the raisins & currants, and pat them dry with paper towels. The put them in the sieve, spread some flour on top of them, and toss. This will help prevent them from sinking in the batter and from clumping together. Make a large dimple in the middle of the flour mix. Bit by bit, pour some milk mix into the middle of the flour, and stir-in the surrounding flour with a large spoon. With a hand-mixer and dough hooks, stir for about 5 minutes at high speed. The thick batter will be smooth and elastic, and should fall off the dough hooks in big lumps. Stir the raisins, currants, candied orange peel, and apple into the batter. Fold the fruit into the batter with a large spoon, and then fold the dough over for about 2 minutes. Make sure you get the batter at the bottom, and the fruit is distributed evenly throughout the batter. I put the bowl in a 35 °C (95 °F) warm oven. Put a baking sheet underneath the bowl, in case the dough rises out of the bowl. 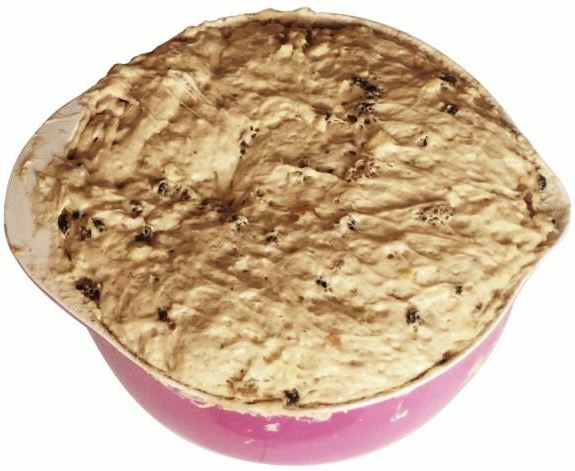 Let the dough rise for 1-1½ hours or until doubled in size. Do not stir the batter again. Line a large colander with kitchen paper. 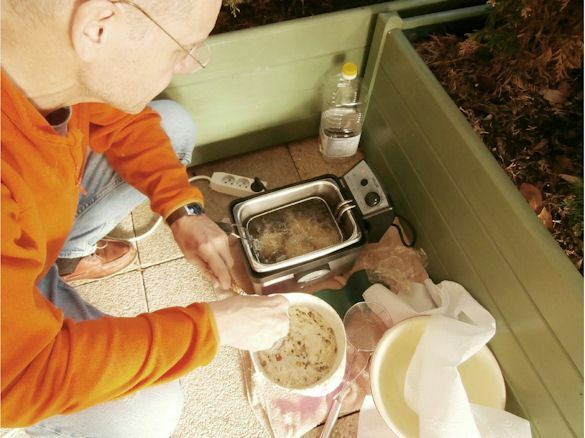 In the electric deep-fryer, heat 2 liters of frying oil to 185 °C (365 °F). Briefly dip two large spoons into the hot oil, then scoop up batter and let it slide into the hot oil (or use one of the table spoons to scoop up batter, and the other spoon to slide the batter of the first spoon into the oil). Do not make the batter balls too big, as it may take too long for the inside to be cooked. Do not fry more than 3-4 at a time, as putting batter into the oil causes its temperature to drop and you need room to turn over the balls. Turn them over every 1-2 minutes with the two spoons. The first time you turn the balls over, they tend to turn back right away - just turn them and hold them for about 10 sec with a spoon. To get a feel for the required frying time, cut open the first oliebol to check for doneness and adjust frying time accordingly. When done, scoop the oliebollen out of the oil with a slotted spoon, and put in the colander to drain. Served "as is", or lightly dusted with powdered sugar. Oliebollen are best when freshly bakend and still warm. You can easily "refresh" them by spreading them out on a large baking sheet and heating them in a 160 °C (320 °F) oven for 5 minutes. No need to abstain from these goodies until Christmas / New Year: oliebollen are great in summertime (or any time, for that matter), with a glass of champagne! Do not make more than one batch of batter at a time, as the dough will rise out of the bowl. ©2001-2019 F. Dörenberg, unless stated otherwise. All rights reserved worldwide. No part of this publication may be used without permission from the author.